Part 1 Risks and their control: Setting up the workplace; First aid and accident reporting; Fire; Compressed and liquefied gases; Fume, dust, vapour and gases; Control of exposure to fume, dust, vapour, gases; Radiation; Noise and vibration; Mechanical hazards. Part 2 Processes: Gas welding, cutting and preheating; Arc welding and cutting; Plasma arc processes; Electroslag welding; Resistance welding; Thermit welding; Electron beam welding; Friction welding; Laser welding and cutting; Brazing and braze welding; Soft soldering; Thermal spraying; Welding and flame spraying plastics; Inspection and testing; Welding in more hazardous environments. Part 3 Legislation and appendices. 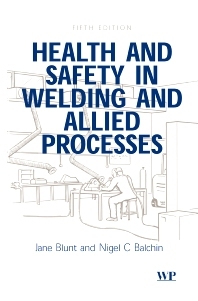 This edition of Health and safety in welding and allied processes has been extensively revised to take into recent account advances in technology and legislative changes both in the UK and USA. Beginning with a description of the core safety requirements, it goes on to describe the special hazards found in the welding environment – noise, radiation, fume, gases and so on in terms of their effects and the strategies that can be adopted to avoid them. The book takes each major joining technology in turn and discusses the key hazards that are most relevant to each process. There are chapters covering: the common arc and gas welding processes; specialised welding processes; brazing, soldering and thermal spraying; welding and flame spraying of plastics; radiographic inspection; mechanical hazards; noise and vibration; radiation; compressed gases; fume and ventilation; fire and first aid; and welding in situations of increased hazard, such as those requiring special precautions to ensure safe working on vessels contaminated by flammable materials. The aim throughout the book is to explain the hazards clearly and concisely, describe how they arise, and suggest practical methods to achieve safe working. Health and safety in welding and allied processes is an essential resource for welders, their managers and all health and safety practitioners who have welding and related processes taking place in their workplaces. Dr Jane Blunt is a materials engineer who spend several years at The Welding Institute (TWI) undertaking projects associated with a variety of welding processes. After being appointed safety adviser, she studied occupational health and safety and is a professional member of the Institution of Occupational Safety and Health. She is currently Safety Officer at the Department of Physics, University of Cambridge. Dr Nigel C. Balchin was a Senior Lecturer in the School of Welding Technology at TWI where he worked on a wide range of courses before moving into the area of producing training aids and open learning courses.